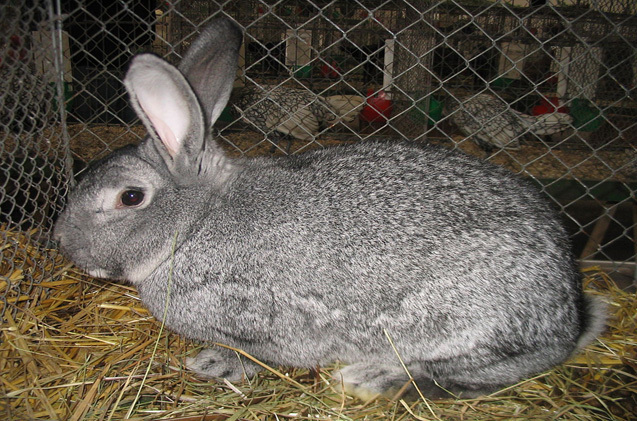 There are different types of rabbit breeds to choose from such as Flemish Giant, lop, and dwarves. How will you ensure that you have chosen the right option? To make things easier, we are providing you the complete guide of the most popular large rabbit breeds of the world. Every rabbit breed has its own different characteristics. Some rabbit breeds are different due to physical characteristics such as the ears of some rabbits are floppy or straight and some have colorful fur. While others are different due to unique personality traits, for example, they need exercise and the willingness to cuddle can also be. So if you are looking to buy a large rabbit, firstly it is very important to ensure that what breed can be important for you in the large rabbit breed because different breeds require different care. We have included only those large rabbit breeds in this article, which will be easy for you to take care of. The most important thing is that there are many people who do not have enough space or money to take care of the more demanding breeds. That’s why only a certain breed can prove to be the right choice for you. If you want to keep a rabbit in the house, first of all, keep in mind whether a member of your family is allergic to the rabbits or not. People who are allergic to rabbits often have to face runny eyes, nose, and even anaphylactic reactions. Families who are allergic to pets should consult with the physicians. It has also been found that some people are more allergic to certain types of the breed than others. That is why it is extremely important to get the whole family checked out before buying a rabbit. If you want to buy a female rabbit in large rabbit breeds then you are immediately informed that you need to spay her at the age of about 6 months. According to the statistics, over 70% of unspayed rabbits have to suffer from uterine cancer after 3 years of age. According to Donnelly, if you want to protect female rabbit from uterine cancer and for decreasing aggression, you should spay her. Also, spay or neuter plays an important role for those who are keeping more than one rabbit in the same place. The other thing is that if you are interested in keeping two or more rabbits in the same place, then you should also keep in mind that both rabbits should not be male or female. It is often seen that either male or female rabbits have aggression towards each other. So it is very important to consult a veterinarian before bringing the second rabbit, Donnelly said. The large rabbit breeds can stay anywhere for a long time if the proper environment along with proper diet is provided to them because they require a special type of care. It is commonly seen that there are many people who like to let the rabbit roam freely in the house but only when they are at home. It is extremely important to supervise the activities of rabbits while roaming freely in the house. Roaming freely can cause health problems for them because they are often fond of chewing. As a result, they can chew such things which may prove harmful to them. In this way, they may suffer from gastrointestinal disorders to poisoning. Diet- It is extremely necessary to provide a proper diet to keep the rabbit healthy. Usually, they need a fiber-rich diet. Their main diet should consist of grass and hay. But you can feed them another food item also. For example, you can include pellets, fruits, leafy greens in their diet in the fixed quantity. Only a balanced diet can keep your large rabbit breeds healthy and happy. Their balanced diet involves an unlimited amount of grass and hay, a mug of leafy greens, 2 pieces of fruits, and 2 tablespoons of pellets per day. On the other hand, limit the darker greens such as kale, collards or spinach. The amount of calcium and oxalate is very high in these vegetables. An excessive amount of calcium and oxalate can cause bladder stone. According to Donnelly, due to excessive amounts of fruits and sugar-containing foods, they may face health-related disorders such as dental disease and gastrointestinal disorders. Cage for large rabbit breeds- Choosing the right cage for the rabbit definitely gives them a safe and comfortable place. Keeping the size of the rabbit in mind, the rabbit cage should be selected. According to Donnelly, bigger is better. Under the Animal Welfare Act, it should be at least six times bigger than your rabbit size. So you should make sure that your rabbit needs enough space to roam, play and hide in the cage. The cage should be such that can meet all the needs of the rabbit. For example, all essential things like a water bottle, hay feeder, litter box, and a playhouse should be available in the cage. When they feel tired, the playhouse offers them the perfect place to play, hide and relax in the cage. Toys- Most rabbits like to spend time with their owner. So try to spend playtime as often as possible with your rabbit outside the cage. When it comes to toys, although they like to play with all types of toys, those toys should be given that are safe to chew and play. Grooming- When it comes to bath, the rabbit doesn’t need daily baths like other animals because they are naturally very clean. Also, You should trim the rabbit’s nails every sixth week. Use the special nail clippers and you should consult with your veterinarian before trimming the rabbit’s nails so that you can do it with the proper technique. If you cut rabbit’s nails very closely, then it can be the reason for the bleeding. Also, it is necessary to brush their coats at least once a week. You can do more if the fur is long of your rabbit. This breed is a multi-purpose breed that is developed for meat and fur. So this is a great option in the large rabbit breeds. There are two types of American rabbits. First is the white American rabbit which fur is white and the rabbit has red-colored eyes and second is the “Blue” American rabbit whose color is dark grey. American rabbit’s body is found in the shape of semi-arch that means the body’s top line curve upwards at the midsection rather than behind the ears. The ears of these rabbits are long, tapered and narrow. They weigh between 9 to 11 lbs and their lifespan is between 8 to 12 years. This breed has a very attractive coat. Both blue and white American rabbit fur are small, soft and silky in touch. Due to being naturally clean, you should not give them a bath as far as possible, otherwise, they may have to go into cardiac arrest and even many natural qualities of their fur can be destroyed. You can brush them to keep dirt-free but keep brushing minimal. If you want to keep the American rabbit happy, you should buy extra large habitat for them and their food must contain 70% of pellets and hay. Adult rabbits eat 1/4 cup of high fiber pellets for every 5 pounds in addition to fresh fruit and leafy greens. To keep the rabbit happy, it is very important that rabbit stay healthy. Although this breed is not suffering from any particular health problems, without care, they may suffer from many health problems. For example, hairballs, uterine tumors, calicivirus, and overgrown teeth. These problems can be prevented by proper care as if you feed them high fiber diet and hay, this harsh food is helpful in keeping their teeth wear down. This breed has been found to be calm and docile. They have an easy-going attitude around humans. On the other hand, if your family has younger children, we do not recommend buying this breed as the American rabbit may be a little skittish. They try to defend themselves from human hands. As a result, access becomes difficult for children. The American rabbit likes to hang out and even they have very good motherhood ability. If you are looking for such a rabbit then this is the right choice for you in the large rabbit breeds. American Chinchilla is famous for a commercial-shaped body that is developed for meat and fur. When these are fully developed they weigh between 9 to 12 lbs. Their body is medium in length with well-rounded hindquarters. They have long and erect ears. Their hair is slate blue at the base and there is also a light grey color in the middle part. Only this color of the American Chinchilla is accepted by the ARBA. The coat of American Chinchilla is short and even soft in touch. As a result, they do not need much maintenance. This breed shed hair during the spring then you should brush them twice a week until the shedding season does not stop. You can keep American Chinchilla rabbit in indoor or outdoor anywhere until extreme heat or cold. Due to its large size, you should buy a larger cage so that the rabbit can spend an interesting indoor time. This is the reason that we do not recommend this rabbit for the apartment residents. When it comes to food, the diet of this rabbit is also similar to the diet of other rabbits. Their diet includes 70% hay and the remaining 30% contains high-quality pellets, leafy greens, fruits, and vegetables. The hay keeps them healthy. It is also helpful in preventing their teeth grow. If you want to protect them from other health problems, they should be spayed at the age of 5-6 months. It is easy to handle for humans. The American Chinchilla has proved to be a great and well-mannered pet in the large rabbit breeds. On the other hand, this rabbit is difficult to potty-train. So you should place extra litter boxes so that they do not have difficulty finding the litter box. If you keep this rabbit out of the cage for a long time, its personality will flourish. As a result, they establish good relations with the owner. 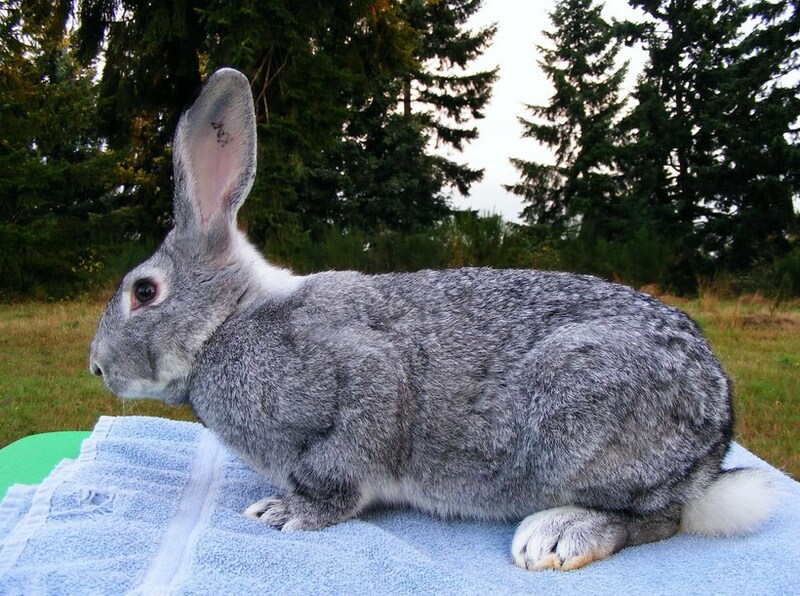 The Beveren is a large rabbit that can grow up to 12 lbs. Its semi-arch shaped body looks very attractive with a round face. The Beveren is found in various colors yet only three colors solid black, blue, and white are accepted by the ARBA. The rabbit has long and erect ears on its head. The ears of these rabbits can reach up to 5 inches when the rabbits are fully developed. Their lifespan is between 5 to 10 years. The Beveren’s fur is soft and dense. Also, their coat is short and glossy which seems thick to touch. Like some other rabbits, this breed shed hair during the fall or spring months. But their fur is short, so the fur does not so visible than others. Therefore you should pay attention and simply brush them twice a week. This breed enjoys both indoor and outdoor. If you want to keep them happy, you will have to buy an extra large cage. Keep one thing in mind that the base of the cage should not made of wire as the wire base can hurt the rabbit’s feet. Usually, they require a comfortable bed. In the large rabbit breeds, there are only Beveren who likes to explore things around them. So do not leave them alone because leaving them alone can be dangerous for them. So it would be safe to keep them in an indoor cage. As you know very well that poor diet causes many problems. They require 70% hay and 30% mixer of pellets, fruits, vegetables, and leafy greens to stay healthy. Also, their ears should be checked twice a week for ear mites. Beveren is the most energetic rabbit in the large rabbit breeds, along with being well-mannered and intelligent. This breed is best suited for singles, couples, and families with older children. However, it can be difficult for younger children to handle the rabbit. Also, this rabbit is not easy to potty-train. So place extra litter boxes so that they can easily find the litter box. 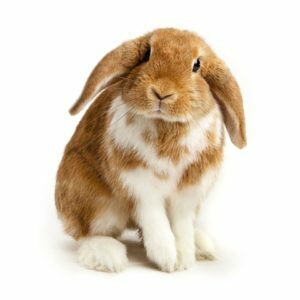 In the large rabbit breeds, English lop may be a great option for the first time rabbit owner. This breed was developed in the 19th century. In the large rabbit breeds, it is the most popular breed for its long and extremely large ears. Their ears are 24 inches long which fall on either side of the rabbit’s face. When fully grown, they can weigh up to 12 lbs. Including a narrow head, it has semi-arch shaped body. This breed is found in various colors such as black orange/fawn, grey, white as well as blue. 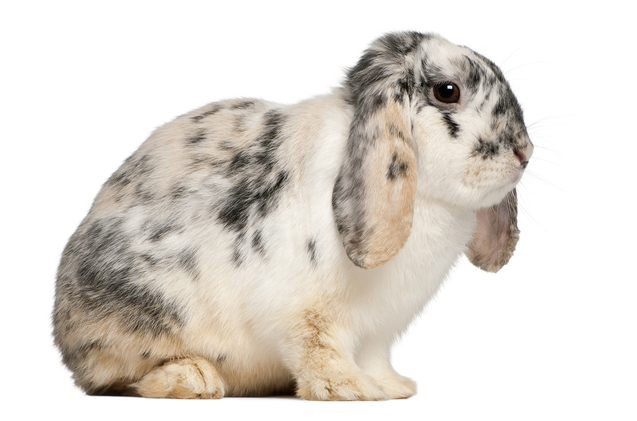 Generally, the female English Lop starts breeding at 9 months of age and the pregnancy period is between 28 to 31 days. Also, their lifespan is up to 7 years. This rabbit has soft fur. The flyback coat is smooth and short. As a result, more care is not needed. Even they groom themselves. if you find that the rabbit is shedding more hair than usual, then you should brush them twice a week. With the help of a slicker brush, you can eliminate stray hairs effortlessly. Do not let their coat become more messy than usual and do not use a damp towel to clean if it is messy. In the large rabbit breeds, this is the only rabbit that needs more care because of its extremely large ears. Their ears have to check regularly and as far as possible do not let the wax build up in their ears. Trim its nails regularly because they can put their feet on their ears. Consequently, there may be an injury. In addition to this, they do not require extra maintenance like other large rabbit breeds. Their diet is also like other rabbits diet. Also, you should clean it daily. The English Lop is very famous for its floppy, large ears and amazing personality in the large rabbit breeds. These are very energetic and even though they are adult, their playful nature is preferred by owner. One of their specialties is that anyone can handle them easily as they are calm. They like to spend most of the time with the owner. So this breed is the best choice for the first time rabbit owner. There is a good news for you that the rabbit is easy to potty-train. So they are called intelligent also. In the large rabbit breeds, if you chose French lop, it may be a good choice for you. This breed was developed around 1850 in France out of selective breeding. This breed looks like the Flemish Giant but weighs more than Flemish Giant. They can weigh up to 14 lbs. even though the body is shorter in length. Its ears can be 8 inches long which are shorter than English Lop. It has a thick body with a large head and a wide forehead. This breed seems very attractive with chubby cheeks. The French Lops are found in various colors both solid and broken. Their lifespan is up to 7 years. 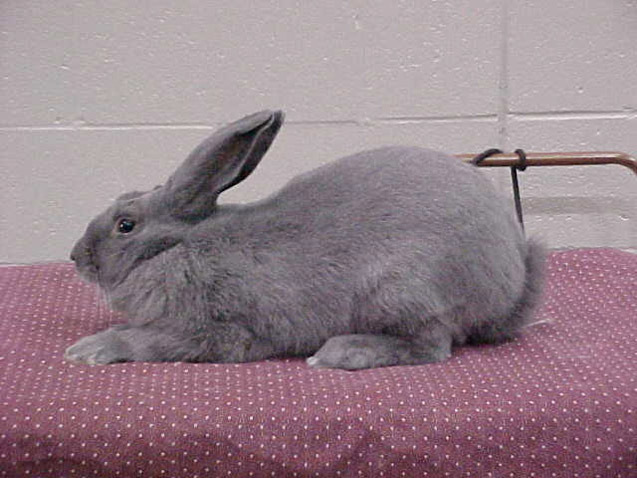 The French Lops coat is usually found dense and short and their fur is soft to the touch. Their coat is short so it is not suitable for making the wool. On the other side, this rabbit sheds more hair than usual during the fall and spring. You should brush them twice a week until the shedding season does not stop. This breed is the largest among the large rabbit breeds, so to keep the rabbit happy, its cage should be larger than a typical rabbit cage so that they may stretch their body comfortably. If you use the outdoor cage, you should protect your rabbit from cold, sun, rain, and heat. They want to roam freely outside with their owner. Due to overweight, it wants more time to roam. So keeping in mind their safety, you should allow them to roam in the backyard. Due to the large-sized body, their overweight is usually not noticed by the owner. Consequently, they may have to face many health problems. So always keep in mind that how much are you feeding them. Because of calm temperament, this breed is the best suited for singles, couples, and families with older children. Anyone can handle it effortlessly. Still, we do not recommend French Lop for the apartment resident and first-time rabbit owner because of giant size. In the large rabbit breeds, this breed thrives on human interaction and prefer to be picked up and petted. if you leave anything around them, they will definitely try to chew. So give them such toys that they gnash their teeth on. And also, they are not easy to potty-train. A lot of rabbit owner like to keep large rabbit breeds for the first time because they have additional space to keep rabbits. However large rabbit breeds require extra space and excessive food compared to other breeds but these are social, friendly and peaceful also. There are many people who say that nothing can be said about rabbit behavior or personality. Still, we are strongly confident that due to overweight, they jump less than other rabbits and are not even naughty. We are strongly confident that our complete guide to large rabbit breeds will definitely help you in choosing the right one.